To honor the strong bond and compassion between two of the most courageous sisters we know, Katniss and Primrose Everdeen, Lionsgate presents a brand new poster and moving tribute of Katniss' sacrifices for her sister throughout The Hunger Games series. Raise your 3-Finger Salute and experience some of the powerful moments these two sisters have endured throughout their fight against the Capitol in the new Trailer For Prim. The Hunger Games: Mockingjay Part 2 tickets will go on sale nationally on Thursday, October 1, 2015 beginning at 12pm EST/9am PST. Buy tickets in the first 24 hours to receive a bonus digital download of The Hunger Games: Mockingjay Part 1! 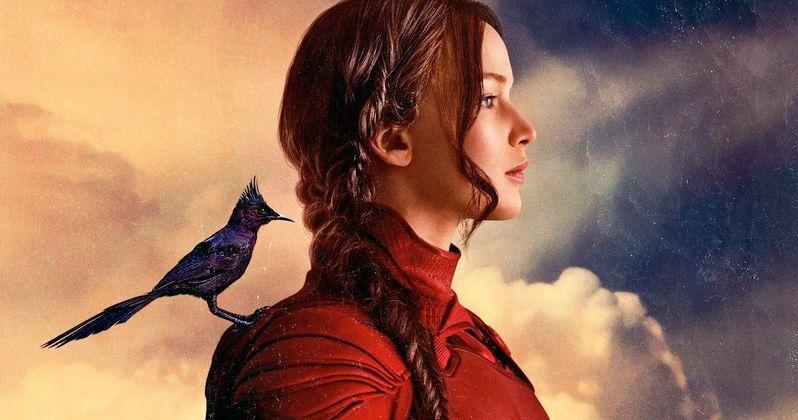 The Hunger Games: Mockingjay Part 2 Showtime's will begin 7pm on Thursday, November 19. Starting on Wednesday, November 18, fans will have the option to screen a double feature of The Hunger Games: Mockingjay Part 1 and The Hunger Games: Mockingjay Part 2. The Hunger Games Double Feature will be a premium experience including exclusive on-screen content and premium giveaways, allowing moviegoers to see The Hunger Games: Mockingjay Part 2 a full 24 hours ahead of Thursday's advance shows. Jennifer Lawrence returns as Katniss Everdeen in The Hunger Games: Mockingjay Part 2. The moving, emotional and action-packed adventure brings an end to the entire Hunger Games saga. Also starring in the movie are Josh Hutcherson and Liam Hemsworth as the main men in Katniss' life, one of which will have to make the ultimate sacrifice. Th rest of the cast includes Woody Harrelson, Elizabeth Banks, Julianne Moore, Philip Seymour Hoffman, Jeffrey Wright, Willow Shields, Sam Claflin, Jena Malone, Natalie Dormer, with Stanley Tucci, and Donald Sutherland. The blockbuster Hunger Games franchise has taken audiences by storm around the world. The first three films have grossed more than $2.2 billion at the global box office, and The Hunger Games: Mockingjay Part 2 will surely be just as big a success. The Hunger Games: Mockingjay Part 2 now brings the franchise to its powerful final chapter in which Katniss Everdeen realizes the stakes are no longer just for survival, they are for the future. And she will sacrifice herself to save humanity. With the nation of Panem in a full scale war, Katniss confronts President Snow in the final showdown. Teamed with a group of her closest friends - including Gale, Finnick, and Peeta, Katniss goes off on a mission with the unit from District 13 as they risk their lives to liberate the citizens of Panem, and stage an assassination attempt on President Snow who has become increasingly obsessed with destroying her. The mortal traps, enemies, and moral choices that await Katniss will challenge her more than any arena she faced in The Hunger Games. The Hunger Games: Mockingjay Part 2 is directed by Francis Lawrence from a screenplay by Peter Craig and Danny Strong. Take a look at the latest poster, which calls Katniss a creature as unquenchable as the sun. And then check out the third full-length trailer which celebrates the bond between sisters, and puts the spotlight on Primrose Everdeen played by Willow Shields.